It may seem odd that a girl raised in the mountains of Colorado loves surfing, but starting a few years ago surfing became one of my greatest passions. While I lived in landlocked Washington, D.C., I was constantly planning my vacations to places where I could surf and I was often staying up odd hours to watch competitions happening half-way across the world in Hawaii or Fiji. Surfing was more of an obsession than just a hobby; it consumed my dreams and was a major impetus for my taking the position at Experience Morocco. Moving to Casablanca meant living next to an ocean and the chance to surf every day. Now living in Casablanca, surfing does in many ways dictate my day-to-day schedule. 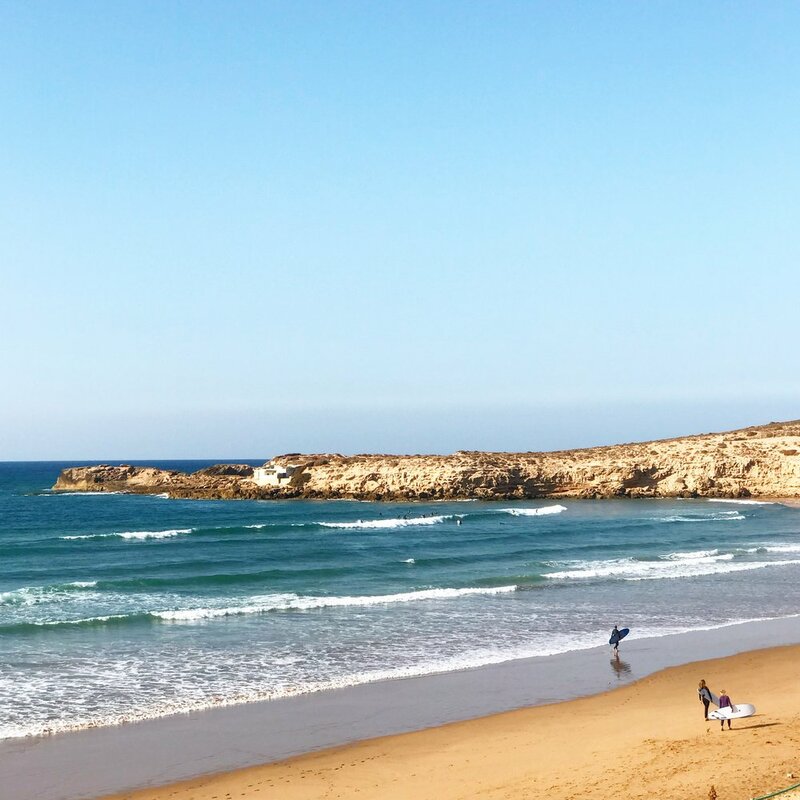 Lucky for me, my role at Experience Morocco allows for flexible work hours, so I can shape my schedule to allow for trips to the beach when the waves are at their best. But surfing in Casablanca has also posed its challenges. The first being how get my surf boards from my apartment in downtown to the beach, a 20 minute drive away. I don’t have a car and my surfboards don’t easily fit inside taxis. This often meant strange looks and hard bargaining in order to convince taxi and Careem [the Middle Eastern version of Uber] drivers to allow me to strap the board to their roof or let it poke out the back window. Now, my friendship with some of the instructors at a local surf school means I can keep my board at the school. I also bought a special rack that allows me to carry my surfboard on my bike. I am really looking forward to summer to actually use this. Right now, I get so cold biking to the ocean, I lose my motivation to then dive in the freezing Atlantic waters. Another challenge is that the ocean conditions this winter have not always been conducive to surfing. The beach in Casablanca is a long stretch of sand that faces north. As winter storms barrel south from the Arctic regions, they create huge swells which translate into big waves. Unfortunately for me, the beach in Casablanca does not handle these big swells well. The beach becomes unsurfable with two and three meter waves crashing on the shallow sand banks, and the wind blows from the ocean to the land, further deteriorating the conditions. But, since I will be taking a surf instructor qualification test later in February, I still need to practice. This means going to the gym. Some of my favorite memories of this year will actually be interacting with local women at the gym. Three days a week the gym’s pool is open for women. On these days, if I can’t surf, I will go to swim laps. Moroccan women though don’t really use the pool to swim laps; instead it is like a big pool party. Women of all ages floating, splashing, and laughing in the waters. It can be a challenge to find space to actually swim as I dodge other pool users. At first I was getting lots of funny looks, like, "Who is this white girl swimming swimming back and forth?" But soon, women were approaching me to ask where I was from, where I learned to swim, and if I could teach them. It is a challenge to explain in my broken French and Darija the basics of swimming, but I do my best. Mostly, I mime the movements, showing the women how to hold on to the edge of the pool to practice kicking or giving pointers on arm positions. Slowly but surely, I have noticed more women joining me as I swim laps. I never thought I would need to know the words for stroke, kick, and paddle in Arabic or French, but these impromptu swim lessons are growing my vocabulary and connections to the community. I can’t say that these swim sessions have improved my surfing, but they do provide a bit fun and laughter on those days I can’t make it to the ocean. I expected returning to Morocco would feel like coming home. The four months I spent studying abroad in Rabat were some of the happiest of my entire life. I was welcomed wholeheartedly by an incredible host family, my Arabic proficiency skyrocketed, and I developed a new passion for surfing. When I returned to the States, I made it my mission to find a way to move back to Morocco. So when my start date in October for the fellowship at Experience Morocco finally rolled around, I was undeniably thrilled to be returning to the land of syrupy-sweet mint tea, year-round beach weather, and incredibly hospitable strangers. What I didn’t expect was for Morocco to feel so different the second time around. Sure, I was moving to a new city as a young professional, not a student, but Morocco is Morocco. Or not. Turns out Casablanca could not be more different than Rabat. Where Rabat is quiet and maybe a little stuffy, matching the lifestyles of its mostly politically and diplomatically employed residents, Casablanca is chaotic, crowded, and runs on a frenetic energy. Everywhere you look is wild traffic and construction cranes. This isn’t to say Casa doesn’t have its charms, it just didn’t feel homey. Now, as I end my third week here, I am still feeling a bit discombobulated and unsettled, but I also am determined to adapt. Of course, it is not just Morocco that is different, it is me too. I am no longer a student or part of an organized group. This time around I am an expat, a working professional, an individual who must craft her own community. My priority now is to get to know my new home, instead of pining for the one I left at the end of study abroad. This week, I have managed to find a burger joint better than any of those in Rabat and nearly as good as my favorite back in Washington, DC. Another welcome observations is that I receive significantly less street harassment here than Rabat. Maybe it has to do with Casa’s more “cosmopolitan” identity or that everyone is always busy going to somewhere so they don’t have time to make a little comment here or there, but it is a development I won’t complain about. Periods of transition personal, professional, or otherwise are never easy and to have one of these while also navigating language barriers, cultural differences, and wild traffic patterns only adds to the challenge. But in the little moments like surfing at sunset, understanding something a colleague says in Darija, sipping some mint tea, I am finding that same happiness I experienced my first time in Morocco. Everyone at work tells me that Casa is a city you either love or hate; I am still hopeful that it’s a place I’ll come to love and make home.